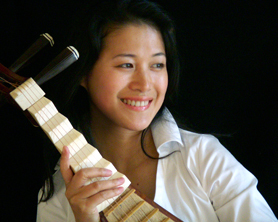 Born in Zhejiang, China, Ms. Zhang was exclusively chosen for the Pipa major by the Middle School Affiliated to Central Conservatory of Music in Beijing in 1982. She entered the college at the Conservatory in 1988. In 1989, she won the “Outstanding Performance Award” in Young Professional Pipa Performer category in the 1st International ART Cup Chinese Traditional Instruments Competition. After graduating from the Conservatory with a Bachelor’s degree in performance in 1992, Ms. Zhang entered Xiamen Opera House as a pipa soloist, visiting Japan, Singapore, Malaysia, Thailand, Philippines and North America. In 2005, she earned the master’s degree in musicology. Having collaborating with Symphony Silicon Valley, the “Bridge” Chamber Virtuosi, Xiamen Philharmonic Symphony and Xiamen Opera House orchestra, and with conductor Paul Lolivnick, Han Zhongjie, Yan Liangkun, and Zheng Xiaoying, Ms. Zhang is highly experienced in performing with Western orchestras. She has also collaborated with composer Yuanlin Chen, Joan Huang, Jim Francisco, and choreographer Alonzo King. Ms. Zhang held a solo recital in 2003 and a quintet concert in 2005 in Xiamen, and recitals in 2007 in Half Moon Bay and San Francisco.